Choo Choo Johnny's Restaurant franchise business opportunity. 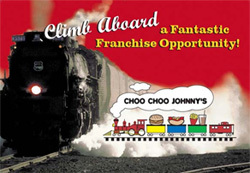 Free Choo Choo Johnny's Restaurant business franchise information. Trains, trains, and meals delivered on train wheels! An interactive train display entertains both the young and old at heart; Guests seated along the counter track will have special food delivery via model train. A variety of train, country, and children's music play in the background enhancing the railroad dining experience. Next Stop - Popularity Plus! The timing for Choo Choo Johnny's railroad-themed restaurant is right on schedule. According to the Model Railroad Industry Association, model railroading is more popular now than at any other time in its 103-year history. The Association estimates that more than a half million American adults spend $500 million annually on this hobby. But model railroading isn't just for adults. Key personnel at retail stores in the industry agree that interest in trains among kids is on the rise, as trains have a multi-generational appeal. As one hobby store owner observed, "I've had children, parents and grandparents come into the store. I don't know too many things that three generations can enjoy and participate in at the same time." And that's saying a lot, particularly in this day and age! Comprehensive Training - You'll be trained in all aspects of our business operations and procedures, including our superb food preparation techniques. You'll learn our highly effective administrative, office, sales, computer software, and marketing procedures. You'll also receive excellent on-the-job training at our flagship restaurant, as well as training at your own restaurant, prior to, during, and after your Choo Choo Johnny's grand opening. Operational Support - Our services include guidance in unit operations and maintenance, customer-service techniques, product ordering, suggested pricing guidelines, marketing support, and administrative procedures. We will provide you with a comprehensive Operations Manual that contains detailed information to be used for ready reference in running virtually every aspect of your business. <?xml:namespace prefix = st1 ns = "urn:schemas-microsoft-com:office:smarttags" />We'd like to talk with you about coming aboard! Choo Choo Johnny's is offering an exciting career opportunity in a franchise with a "just right" blend of components, answering some of today's key needs and interests: family dining, children's entertainment, and model railroading. We are seeking qualified candidates who share our enthusiasm. To learn more about the Choo Choo Johnny's Restaurant franchise opportunity, simply complete the form below.